The generation of new markets is an emerging area of interest among researchers working in the traditions of evolutionary economics. And true to those traditions, the current study incorporates empirical evidence from psychology and cognitive science to develop micro-foundations for evolutionary theories of new market generation. 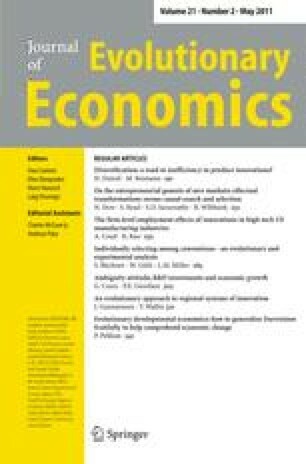 In this paper we present an in-depth analysis of how expert entrepreneurs use effectual logic to conceptualize the creation of new markets. Our results challenge received wisdom based on search and selection processes and move beyond combinatorial ideas to develop instead a “transformational” view of market genesis. We would like to thank an anonymous reviewer at the Journal of Evolutionary Economics for many helpful comments that helped us improve this paper. The usual disclaimers apply. In the following experiment, you will solve two decision problems. These problems arise in the context of building a new company for an imaginary product. A detailed description of the product follows this introduction. Although the product is imaginary, it is technically feasible and financially viable. The data for the problems have been obtained through realistic market research—the kind of market research used in developing a real world business plan. Before you start on the product description and the problems, I do need one act of creative imagination on your part. I request you to put yourself in the role of the an entrepreneur building a company—i.e., you have a little money of your own to start this company, and whatever experience you have to date. Throughout the experiment you should talk aloud the thoughts you are having. Please start by reading aloud the following instructions. You have created a computer game of entrepreneurship. You believe you can combine this game with some educational material and profiles of successful entrepreneurs to make an excellent teaching tool for entrepreneurship. Your inspiration for the product came from several reports in the newspapers and magazines about increasing demand for entrepreneurship education; and the fact that a curriculum involving entrepreneurship even at the junior high or high school level induces students to learn not only business-related topics but math and science and communication skills as well. The game part of the product consists of a simulated environment for starting and running a company. There are separate sub-simulations of markets, competitors, regulators, macroeconomic factors and a random factor for “luck”. The game has a sophisticated multi-media interface—for example, a 3D office where phones ring with messages from the market, a TV that will provide macroeconomic information when switched on, and simulated managerial staff with whom the player (CEO) can consult in making decisions. At the beginning of the game, the player can choose from a variety of businesses the type of business he/she wants to start (For example: manufacturing, personal services, software etc.) and has to make decisions such as which market segment to sell to, how many people to hire, what type of financing to go for, etc. During the game, the player has to make production decisions such as how much to produce, whether to build new warehouses or negotiate with trucking companies, etc. ; marketing decisions such as which channels of distribution to use, which media to advertise in and so on; management decisions involving hiring, training, promoting and firing of employees, and so on. There is an accounting subroutine that tracks and computes the implications of the various decisions for the bottom line. The simulation’s responses to the player’s decisions permit a range of possible final outcomes—from bankruptcy to a “hockey stick”. You have taken all possible precautions regarding intellectual property. The name of your company is Entrepreneurship, Inc. The name of the product is Venturing. Who could be your potential customers for this product? Who could be your potential competitors for this product? What information would you seek about potential customers and competitors—list questions you would want answered. How will you find out this information—what kind of market research would you do? What do you think are the growth possibilities for this company? In this problem you have to make some marketing decisions. The following are the results of the primary (direct) market research that you have completed. You get 600 hits per day. 300 of them actually download the product. You have 500 filled out questionnaires so far. Focus Group of educators (high school and community college teachers and administrators) The educators who participated in the focus group find the product exciting and useful—but want several additions and modifications made before they would be willing to pay a price of over $150 for it. As it is, they would be willing to pay $50–80 and would demand a discount on that for site licenses or bulk orders. Both at the bookstore demo and the focus group, participants are very positive and enthusiastic about the product. They provide you good feedback on specific features and also extend suggestions for improvement. But the educators are particularly keen on going beyond the “game” aspect; they make it clear that much more development and support would be required in trying to market the product to them. They also indicate that there are non-profit foundations and other funding sources interested in entrepreneurship that might be willing to promote the product and fund its purchase by educational institutions. Based on your market research, you arrive at the following cost estimates for marketing your product. None of the following four possible competitors combine a simulation game with substantial education materials—you are unique in this respect. Which market segment/segments will you sell your product to? How will you price your product? How will you sell to your selected market segment/segments?